I think I hate what may be your favourite salad. Maybe hate is too strong a word, but aside from a few restaurants where they execute the Caprese salad differently, I would never order it. 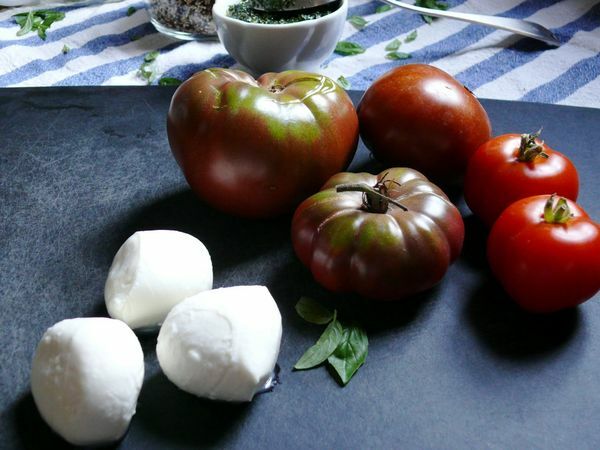 I’m obsessed with tomatoes, and I appreciate the silky, blank slate that is fresh mozzarella, so my issue, I’d say, is with the basil. Somehow biting into leaves of it in the traditional Caprese just doesn’t work for me. It’s a texture thing, because I agree that the flavour belongs alongside the tomatoes, cheese and olive oil. So I kinda changed it. Your favourite salad. And added quinoa. Stay with me! 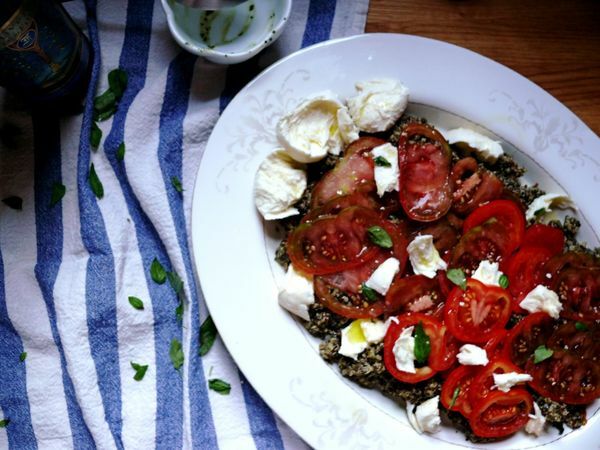 Instead of layering large basil leaves in this salad, I made a basil oil that seasons the quinoa. Then I sliced the tomato as thin as possible, because even though this salad is more substantial than the original, it’s also more delicate, with the whole basil leaves, the toothsome part of that other version, out of the way. I did save some of the baby leaves for garnish, a tiny bite here and there isn’t prone to offend (me). The rest, in oil form and mixed into the quinoa, actually ensures its essence works its way into every bite. This salad is something to be savoured, not just sliced and stabbed. I feel more strongly about that other salad than I realized. Hopefully I can get past it now. Add the quinoa and 2 1/2 cups of water to a medium pot, cover and set over medium-high heat. Bring to a boil, then reduce heat and simmer uncovered for about 20 minutes, stirring occasionally. stir more frequently in the last 5 minutes to make sure the quinoa doesn’t stick to the bottom of the pot. When the quinoa is cooked and the water has been absorbed, transfer it to a bowl and set aside to cool to room temperature. Meanwhile, add the basil, olive oil, lemon juice, salt, chili flakes and pepper, to a food processor. Blend for a few seconds, stop to wipe down the sides, and repeat one or two times until the purée is basically smooth. When the quinoa has cooled, add the basil oil to it and mix gently but well to combine everything thoroughly. 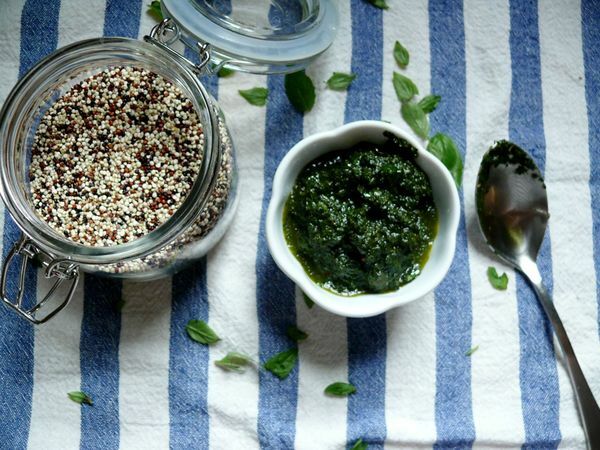 Scoop the quinoa onto a platter or individual serving plates. Layer slices of tomato over top. Tear most of the cheese into bite size pieces and distribute over top, and leave a few pieces large as well. Scatter the reserved baby basil leaves. Drizzle with olive oil generously (why not), and sprinkle with crushed Maldon salt. I agree with your basil stance. Love basil but the big leafy chunkiness in a caprese is not a great balance.